In a week where so many NHL things happened, the San Jose Sharks made relatively few and quite modest moves. The week that was had awards, two different drafts and over two-thirds of the league’s team involved in trades. But for the Sharks, there were few headlines. The highlight, without question, was the first Norris Trophy to come to San Jose. Brent Burns captured the award as the league’s top defenseman. It is the first major award to come to a Sharks player in quite some time. Though Burns struggled greatly over the last month of the season, his dominance in the first five months of the year was enough. In a close vote, Ottawa’s superb Erik Karlsson came in second. Victor Hedman, who probably deserved to be a lot closer to the top two, came in third. San Jose made trades, mostly involving draft picks. The lone player traded was Mirco Mueller. 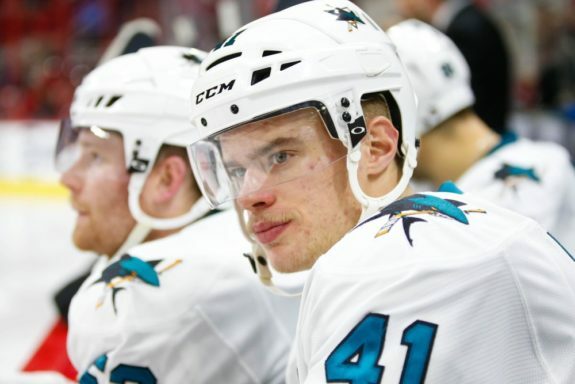 The young defenseman, selected in the first round in 2013, was given chances to show he belonged with the Sharks, but never was able to lift his game. At the time of the trade, Mueller was no better than the 10th best defenseman in the organization. With no near-term path to the big club, moving him was best for everyone. He went to New Jersey. In return, the Sharks gained a second-round pick and upgraded their fifth-round pick to a fourth rounder. While some gnashing of teeth is appropriate, given what San Jose used to get Mueller in 2013, the sunk cost is what it is. San Jose got a solid return given Mueller’s modest progress. The other Sharks trades came on day two of the draft. The New York Rangers took a sixth-round pick from San Jose. In return, the Sharks improved 21 spots in the fourth round. Another trade shuffled picks in the sixth and seventh rounds. 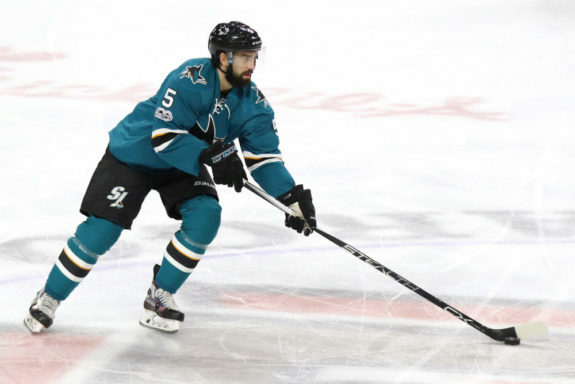 The Vegas Golden Knights’ expansion draft resulted in San Jose losing third-pair defenseman David Schlemko. It was not a surprise, Schlemko had a strong season and has a very team-friendly contract. Vegas quickly traded him to Montreal for a fifth-round pick. If teams think Schlemko isn’t worth much, I’d be happy to see him back in teal. Vegas’ pick of Schlemko was a solid move, while trading him for so little was a complete head scratcher. And, in a back-handed way, annoying. It’s likely Vegas could have gotten more for other Sharks, including Brenden Dillon and Mikkel Boedker. Which might have helped both San Jose and Vegas. On Friday, Ryan Reaves, a fourth line forward known for being very physical, was traded from St. Louis to Pittsburgh for a first-round pick. The trades involving Mueller, Schlemko and Reaves speak to a very fractured trade market. Schelmko, by far the best of the group, went for very little. With certain teams doing significant remodeling work, it is a good time to keep an eye open for solid talent at bargain prices. Or sell off modest assets for a lot more than they are worth. The week ended with the NHL’s annual entry draft. This year’s group was widely considered a weak draft class. 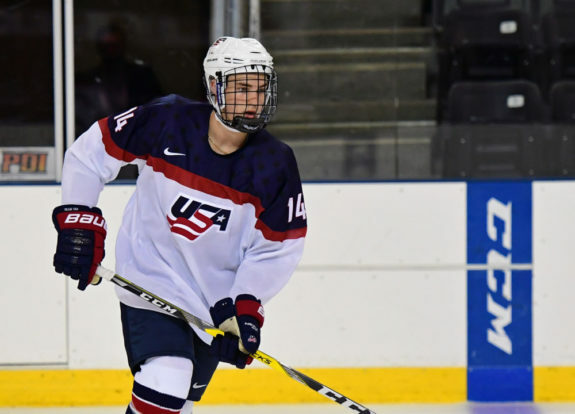 Many were miffed at the Sharks’ early picks, especially their top pick, center Josh Norris. There was a wide range of opinions on Norris and where he should go in the draft. His selection at 19th overall was a bit higher than even the most optimistic projection. I’m hesitant to pile on here. Norris proved an exceptional athlete at the combine, where he finished high in several categories and was tops in peak power output and vertical jump, among others. Not that I’d invest too much confidence in combine tests, but among recent winners in the peak power test were William Nylander, Shea Theodore and Alex Galchenyuk. All players who have been very productive early in their NHL careers. In a weak draft class (which may or may not be confirmed in the years ahead), I’m happy to get one of the best athletes, especially if other areas, including character, fall into place. Which apparently they do. The second Norris of the week for San Jose is committed to playing for the University of Michigan this upcoming season. The second day draft picks, rounds 2-7, brought some curious results. The Sharks took some risks, but also played for upside. Four Sharks picks tumbled down the draft boards. Center Scott Reedy was projected as a late second rounder, San Jose got him in the fourth. A former teammate of Norris, the two will now compete against each other in the Big Ten conference where they should meet four times a season, as Reedy is headed to the University of Minnesota. Center Sasha Chmelevski, who many anticipated gone by the third round, was there for San Jose to grab in round six. A player who tumbled in a different way, winger Jacob McGrew, was also taken in round six. He missed the most recent season with injuries, which makes it difficult for scouts to form an impression and easier for teams to overlook. He wasn’t out of sight, out of mind for San Jose, however. The Sharks final pick, winger Ivan Chekhovich, is again, a player many anticipated going much earlier. The Russian-born Chekhovich competed in Canada this past season and led his Baie-Comeau Drakkar team in scoring. 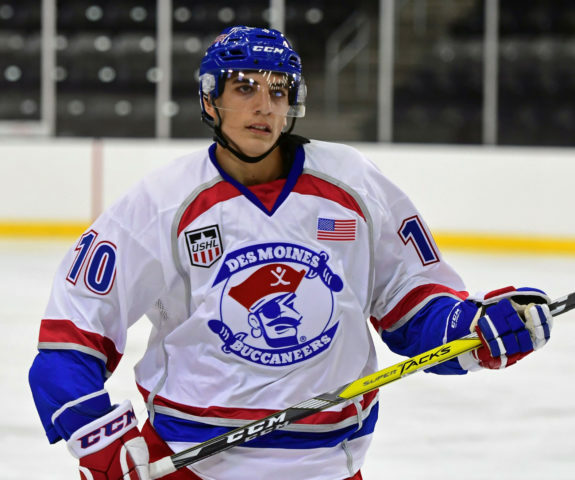 The lone defenseman drafted by San Jose is Mario Ferraro, who was taken in the second round, about a round earlier than most expected. As this week wraps up, all eyes turn to the major decisions and contract extensions in the weeks ahead. Very soon, it will be deal or no deal in San Jose for Patrick Marleau and Joe Thornton. Though less critical, Chris Tierney and Micheal Haley both need new deals. Meanwhile, Martin Jones and Marc-Edouard Vlasic are looking at major contract extensions, those can’t be signed until July 1. If negotiations have gone well, it won’t be a long wait for those two. While it is not clear which younger players will play in the game, the Sharks will host their annual prospects game on July 6. 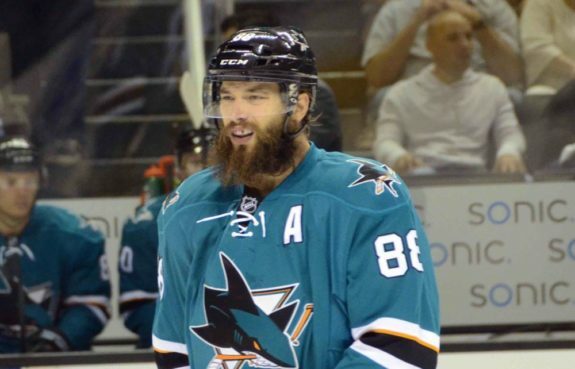 Finally, ESPN’s body issue features the two most famously bearded Sharks, Brent Burns and Joe Thornton. This won’t change the Sharks’ trajectory for the upcoming season, but might add some, ummm, visibility, for the team. For those who are curious, the tattooed Chinese (or Kanji) character near Burns’ heart means love.